Once again promoted to Private First Class, Sam Avery was discharged from the hospital in late September and rejoined Hdq. Co., 103rd Infantry by October 4, 1918. He was issued a replacement gas mask, rifle (#138211) and bayonet (#691932) and took his place back in the ranks just in time for the 26th Division to participate in the Meuse-Argonne Offensive. The Meuse-Argonne Offensive had formally commenced on September 26, 1918 and was both the largest American military operation and greatest AEF victory of the Great War. 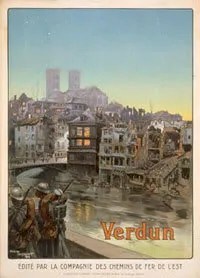 Following the St. Mihiel operation, the 103rd Infantry was heavily bombarbed by gas at Saulx before being relieved on October 6-7 when it moved north of Verdun, marching by night. 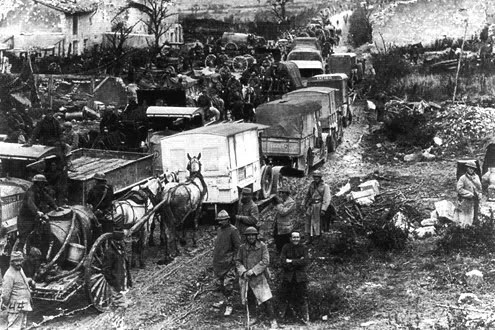 The movement was difficult due to bad conditions of the roads and the sheer number of troops being concentrated in the area for the upcoming offensive. By October 9, the entire Regiment had arrived in the vicinity of Fromereville with HQ established at Moulin Brule. 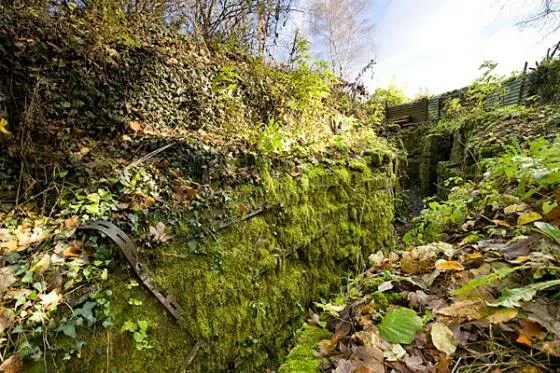 On October 10, the 26th Division’s HQ was opened in the battered citadel at Verdun with the troops located in camps and billets to the southwest. On October 13, the 52nd Brigade entered the lines attached to the French 17th Corps with Brigade HQ established in the ruins of Cumieres. The line occupied by the 17th Corps extended from Sivry east to Molleville Farm Wood, then southeast to Haumont Wood and Caures Wood. On October 14, the 103rd Infantry moved to Cote d’Oie in preparation to take over a sub-sector on the line. The night of October 15-16, the 26th Division completed relief of the French 18th Division in the Neptune Sector from Ormont on the left to Beaumont on the right. The 52nd Brigade held the right side of the line in a tangle of trenches north and northeast of Cote de Poivre. All battalions of the 103rd Infantry moved into the front lines on the nights of October 22-23, occupying old German positions which were in a bad state of disrepair. From the moment of its arrival on the line until the very end of hostilities, the 103rd Infantry was subjected to severe artillery fire. 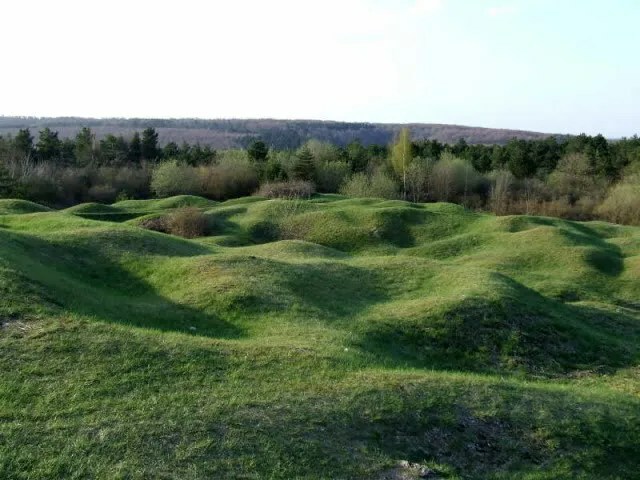 Facing them, the German 1st and 32nd Landwehr Divisions had constructed layered defenses over months which proved highly resistant to attack including artillery, machine guns and intricate trenchworks embedded in a muddy moonscape with observation points on the heights above. The weather was dismal with a continual rain and cold river mists saturating everything including clothing and blankets. Dugouts and trenches were flooded and knee-deep in mud, hillsides were mud piles torn by constant artillery and sniper fire, the roads were impassable, and toxic gas permeated everything. 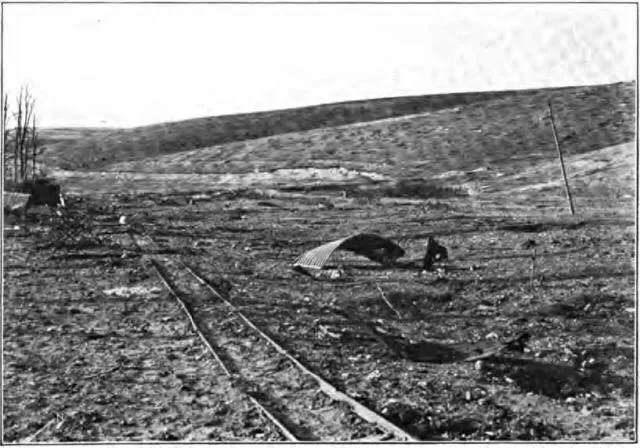 Exhausted and clad in worn, filthy clothing, the men also had insufficient hot food and were forced by necessity to use untreated water from any source including puddles and shell holes which caused many cases of diarrhea. What further added to the misery was an outbreak of dreaded influenza that took its own share of casualties across all ranks. On October 23-27, the 51st Brigade on the left side of the line struggled to clear the eastern ridge of the heights of the Meuse with mixed success and very heavy casualties while the 52nd Brigade remained in place at Bois d’Haumont (Point A) protecting the right flank. The 103rd Infantry’s center of resistance was along the captured “Kriemhilde Line” at the Tranchee de la Mamelle near Romagne with the 104th Infantry positioned to their left. Division casualties during this time included 261 killed, 1,287 wounded, 1,229 gassed and 231 missing. 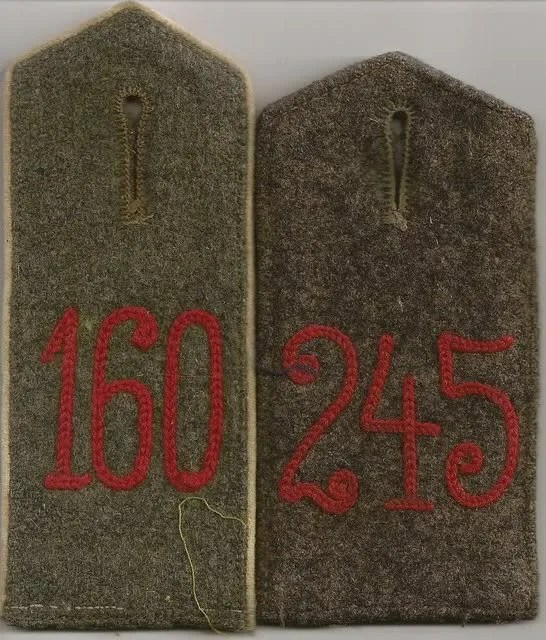 On November 6, a battalion each from the 103rd and 104th were briefly redeployed to the area of Ormont Wood in support of the U.S. 79th Division and were occupied with making regular trench raids on the German lines to capture prisoners. On November 7 the entire 26th Division front was bombarded by 3,000 gas and 6,000 high explosive shells as the Germans prepared to withdraw. On November 8 in response to evidence of a German withdrawal across the front, the 103rd Infantry pushed into the German front line positions in their sub-sector and occupied them. Immediately the detached elements of the 52nd Brigade were recalled and a new 26th Division advance line was established on the heights above the Azannes-Damvillers road (Point B). New orders on November 9 changed the direction of advance to the southeast with the objective of the hills called the “Ornes Twins” and the village of Azannes. 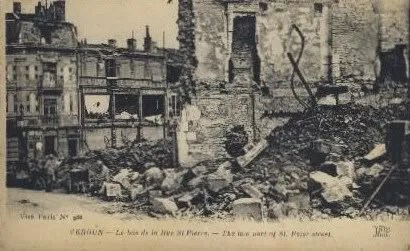 After being held in check by German machine guns during the remainder of the day, on November 10 the 103rd Infantry captured Town Wood and the 104th Infantry flanked the enemy at Ville-devant-Chaumont. At 2100 hours on November 10, despite rumors that an armistice would be signed on November 11, orders were published directing a new attack on Les Jumelles d’Ornes, Hill #265 and Maucourt the next day. On November 11 at 0545 hours, a radio message from Marshal Foch was received that stated hostilities would cease along the entire front at 1100 hours French time, but much to the dismay of American officers, the order for the 26th Division to attack commencing at 0930 hours remained unchanged. Information about the cease-fire was deliberately withheld from the rank and file to keep order and discipline intact during the continuing offensive operations. The 103rd Infantry made its final advance in line with the other regiments in pursuit of the retreating Germans, reaching the road south of Ville-devant-Chaumont (Point C) before coming to a final halt at 1100 hours. The men of the 103rd were occupied with clearing machine gun nests until the very last moment, and some were angered when their artillery support suddenly stopped before realizing that hostilites had finally ended. 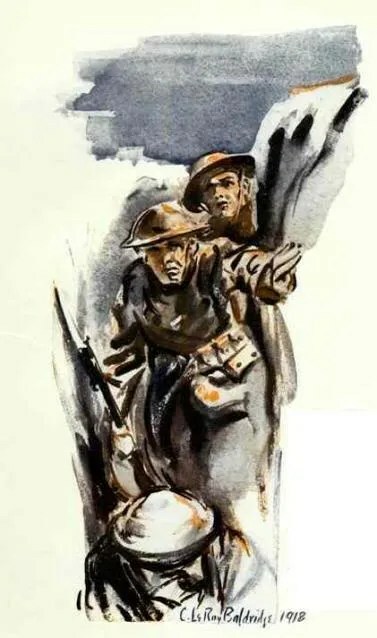 Across the entire front the guns fell silent, followed by frantic cheering from the men on both sides who had already counted themselves dead and now realized they had been given the gift of survival. But the joy of Sam Avery and the men of the 103rd was tempered by the memory of those who had recently fallen: Casualties in the 103rd Infantry during the 11 days of November were over 400 killed and wounded with 500 additional gassed. Just before dusk on November 12, one officer and 10 men of the 103rd Infantry who had fallen during the last 2 days were buried in one large common grave on a hillside at the edge of Bois de Ville. This marked the most forward position of the 103rd Infantry’s final advance in the Great War. Among the men killed on the final drive before the Armistice was Moses Neptune, son of the Passamaquoddy Tribal Governor William Neptune. Although not considered a full American citizen (Congress enacted legislation on November 6, 1919, granting citizenship to Indian veterans of World War I), Moses had enlisted for service at the young age of 19 along with 34 other volunteers from the small tribal enclave of Pleasant Point, Perry, Maine. Read the Chaplain’s letter to Tribal Gov. William Neptune here. Read Soldier’s Mail during the Meuse-Argonne Offensive here: October, 1918; November, 1918. My great grandpa was an Argonne Vet. His name was Archa Owen Roberts, PFC/361 INF/91. Thanks so much. He is now honored on the Roll of Remembrance. My Great Grandfather also was there with the 104th. I have added your great-grandfather to the Reader’s Roll of Remembrance. Please share if you have any additional information regarding his company, rank and whether he was wounded. My Great Great Uncle was a Private First Class in Argonne. He died there of Pneumonia in January of 1919. His name was George Reicheneder. Thanks so much for the work you do on this site. I can’t begin to tell you what it means for future generations. Thanks so much for your kind words! I have added your great uncle’s name to the Reader’s Roll of Remembrance. Please let me know his unit information if you have it. My Husband’s great uncle fought in the Meuse-Argonne Offensive. I’m researching his story and would love any suggestions. Stumbled on your blog, great site! My father, William Clyde Comstock, was a private and was in the Argonne Offensive from Aug 1918 to Apr 1919. I got that info from his discharge record and that’s about all I know about his tour of duty. I have his gasmask at my home; his helmet is also in the family. For 12 years we have a holidayhome near Damvillers and have roamed the woods of the battlefield. Interesting and intruiging to read about the US participation 2 years after the Battle itself. There´s not so much to read on this last but final stage of the War in this region. There in fact was a specific coverage of the Lafayette campaigne in Verdun 2 years ago. My great grandfather, Pvt. Frederick W. Conde M.G. Co., 16th infantry was killed in action on October 9, 1918 in the Meuse Argonne Offensive. My grandfather served in Meuse-Argonne in 1918. He was awarded the Bronze Victory Button (according to his papers – I do not have possession of the award). His name is Wesley C. Brewer. One document shows that he was promoted to Sergeant, Company “E”, 2nd Engineers in 1921. My grandfather passed away over 30 years ago. I’m only now discovering his valiant history. I sure wish I could have had the chance to hear his stories. My great uncle, Andrew J. Ostlund was with G Co. 177th Brigade, 89th Division and died on November 2, 1918, on Barricourt Hill. His 1st. Sgt. who witnessed his death was August Duennes. I have reseach and written a small book of Andew’s life. My Grandfather, Anders J. Weigen M.D. was with the Evac Hospital No15. During that time Corporal Joseph Levings gave him a small journal that was found in a foxhole. The original owner is unknown. You can see photos of the journal and read some of its passages on my blog minerrogersweigenfamilytree.blogspot.com under Lost, Found and Remembered. My great uncle, Turner Branham died during the Meuse-Argonne Offensive on October 5, 1918. His remains remained in Romagne, France. A tombstone in the Mt. Pleasant Church cemetery near Poseyville, Indiana reads, Oliver P. Marquis, Co. K 166th Infantry, Killed in Action in Argonne-Meuse offensive, November 7, 1918. Any chance you might have some information on this gentleman or the action of November 7? Reading through my grandfather’s military discharge papers, I found out yesterday that he fought in the Argonne-Meuse offensive. George William Hayward, private first class Co. F, 356th Infantry, 89th Division. My Great Uncle PVT.Fredrick Bullers of the 26th Infantry Company D. Was killed in the Meuse Argonne on October 3rd 1918.Body lies in the Commune of Exermont. My Grandfather, Michael McKeon was in the 116th. Oddly enough he was from Connecticut so we have no idea how he ended up in a Virginia National Guard regiment. My Grandfather, Harry O. Wayland was in the Meuse Argonne offensive, but as far as I know he did not fight directly. He was a sergeant in the 339th Quartermasters Labor Battalion working along side some Engineering battalions that were assigned to road construction…a crucial activity, especially at this time because there were so many troops concentrated in one area. My grandfather Gaitano Alberto Sassi, a bugler in the 103rd, recalled in a news clipping regarding Veterans Day celebrations; “For Gaitano Alberto Sassi, now 86, it will be a day to recall the loss of nearly a dozen fellow American soldiers just two or three minutes before an armistise ws declared and World War ended at 11 a.m. Nov. 11 1918”. I imagine it was a recollection of Bois de Ville. Serial Number: 67096 Birth Place: Italy Age: 19 years Residence: Rumford Comment: Enl: NG Rumford, June 19/16. Reported for Federal Serv: Apr. 13/17. Pvt; Bglr July 18/16; Pvt 1st cl Nov. 18/18. Org: Co B 2 Inf Me NG (Co B 103 Inf) to disch. Eng: Champagne-Marne; Aisne-Marne; Defensive Sector. Overseas: Sept. 27/17 to May 9/19. Hon disch on demob: May 31, 1919. Thanks for the opportunity to learned more about what he must have experienced and to leave his name here with others that served. I am doing research on men who served in WW I from Washington, CT for an upcoming exhibit on WW I at the Gunn Memorial Historical Museum here in Washington. 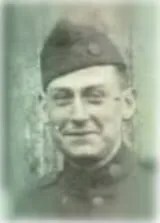 CT. One of soldiers I am researching is a Raymond E Cogswell who served in Company M., 102nd Infantry Regiment, 51st Brigade, 26th Division of the AEF. I know from the Connecticut Rooster of 1917-1920 that Raymond E Cogswell was in a number of battles: “Toul; Toul (Seicheprey); Aisne-Marne; St. Mihiel; Meuse-Argonne; and Chemin Des Dames/ The Connecticut Rooster indicates Raymond E Cogswell was severally wounded.on the 27th of Oct 1918. I suspect he was wounded at. Meuse-Argonne but I am not positive about this. My Uncle–Wilbur Young Cameron–from Easton Penna was killed Oct 26, 1918 there at Meuse-Argonne. I have a photo of my grandfather, Felix Alton Cantrell that was supposedly taken in Verdun in 1918. He is holding a bottle of wine. He was a private in the 55th Infantry, 7th Division Army (AEF). I have a copy of his discharge papers documenting that he was east of Moselle in the Puvenell sector around Armistice Day. Since he never spoke of the war to his family, I feel lucky to know this much about his service. I am searching for any information that might be available about my grand uncle and namesake, Maj. Christopher F Lee, 101st Inft. Regiment, Yankee Div. Currently I am writing a biography of him, tying it in with his service in the Mass. Volunteer Militia up to his death on January 4, 1920 of wounds he suffered in the Meuse-Argonne Offensive on Oct 25, 1918. I am fortunate that he was a man of minor prominence and his death and funeral were heavily covered by the Boston newspapers. I have copies of that coverage which goes into considerable detail. He was a recipient of the Distinguished Cross for his act of gallantry during that battle, followed bt the Croix de Guerre and the French Legion of Honor. A large presence of military attended his funeral, lead by General Edwards. Col. Logan was one of his pall bearers. He joined “the Old 9th” Regiment in 1900, advanced through the enlisted ranks and made lieutenant in1906. In 1916, as a captain, he went to the Mexican border. Very soon thereafter his unit was melded into the Yankee Div. that General Edwards formed from the various MVM units throughout New England. With the 101st, he went to France in September of 1917. He was at that point commander of Company I. He trained with his unit for several months until he was removed to “detached service,” attending advanced officer training. In the spring of 1918, he was assigned as adjutant to General Traub, commander of the 51st Brigade of the YD. In early September he was assigned to the 102 Inft. Regiment and advanced to the rank of Major, whereupon he was made the commander of the 3rd Battalion. It was in this command that he lead an almost suicidal charge against well fortified German machine-gun nest. I would like to compliment Len Kondretiuk of the YD Muesum and Archive in Concord. He was able to dig out information that I believed was lost in the1973 St Louis fire. There are still, however, some gaps in the information about my grand uncle. My request is That if anyone who sees this posting and who might possess information from their ancestors, no matter how fragmentary, regarding Maj. Christopher F Lee please respond, so that I might add details to the dialogue of this very brave soldier. My Grandfather was Leonard R. Grose from S. Gardiner, Me. Enl. NG Augusta, May 27, 1917 Pvt.,Cpl. Sept.3, 1918. Org. Co.M 2 Inf. Me. NG ( Co. M 103 Inf. ) to discharge. Eng. Champagne-Marne; Aisne-Marne; St. Mihiel; Meuse-Argonne; Defensive Sector. He was wounded in action June 19, 1918. Overseas Sept. 27, 1917 to Apr. 7, 1919. He was honorably discharged on demobilization Apr 28, 1919. Please remember him and add his name to those that also served. I just learned that my great uncle, private David S. Benkowski, died on 7 October 1918 of gunshot wound and being gassed. He was part of Company D, 129th Infantry, part of the battle of Verdun. Apparently joined up in Chicago, Illinois area but was born in 1888 in area of Lodz, Poland. He’s buried in Meuse-Argonne American Cemetery. There’s a picture of his grave marker on findagrave.com. I found a ring that says my grandfathers initials, AEF and 1917-19 on top. On each side it says Argonne and Meuse. Where did he get this ring? My Uncle Harry Benson Insley was a vet of the Meuse-Argonne Defensive action. On 8 October 1918 near Sivry France he took out an enemy machine gun. For his actions he was awarded the Distinguished Service Cross General Order NO. 37 WD 1919. My great uncle, Isadore Olian (Brooklyn, NY) was killed on October 2, 1918 in the Argonne forest, presumably as part of the Argonne offensive. How would I find out more details of his service? My Grandfather, Claude Evert Cormana served in WWI in the 143D Field Artillery and fought in the St. Mihiel; Meuse-Argonne offensive. I do not know much about this and would love to know more. Residence:	1823 Auburn Ave., Cleveland, O.
Assigns Comment:	157 Depot Brigade to 12 July 1918; Cp Gordon Ga July Automatic Replacement Draft to 10 Aug 1918; Co O 163 Infantry to 17 Aug 1918; Co E 28 Infantry to Discharge Corporal 12 July 1918. St Mihiel; Meuse-Argonne; Defensive Sector. American Expeditionary Forces 21 July 1918 to 1 March 1919. Honorable discharge 15 March 1919. Co b 322machine gun battalion, Co g 329 infantry, co K 104 infantry , private 1st class Walter J. Burke. St Mihiel; Meuse-Argonne Defensive sector. Was gassed by the Germans November 7, 1918. He lived to be 76 with one lung and is my grandfather. Nation Army.Co B322 Machine Gun Battalion.Co G329 infantry.Co K 104infantry St Mihiel,Meuse-Argonne,gas by the German November,7 1918. My name is Nancy Parker, my Great Uncle (ARTHUR LEE PARKER) was killed by shell fire on November 6,1918 during the Meuse-Argonne War. He was in Suppy Company with the 314th Field Artillery Division, if any of you have seen a copy of “Call To Arms”, he is one of the three on the cover. I’ve been trying to find what I can about him, but like most my age, I didn’t have enough time or patience to ask questions, much less listen. Now everyone that knows what the answers to my questions are, have long passed on. We have a memorial in the family cemetery in honor of my great uncle, some say it’s just that in his memory, most say he is buried there, some say he was buried in France and others say due to the way he was killed, there wasn’t anything left to bury period! 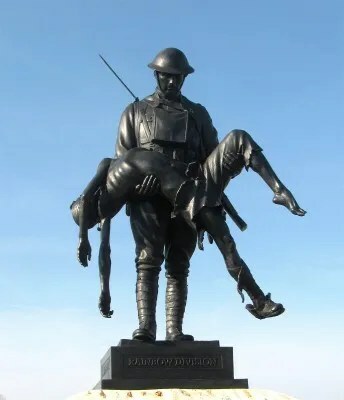 My Great Uncle gave the ultimate sacrifice almost 100 years ago, I’m ashamed to say I have no idea what really and truly happened to our family hero. If anyone out there has any clue where I can start, please let me know. I have a few things I’ve found throughout the years from family, not much I’m afraid. I’ve written Washington D.C. they forwarded me to Missouri, both were useless. I went to VITAL STATISTICS here in VA, for a Death Certificate, they said since he was killed in FRANCE, it would be there of course a copy may have been sent to his next of kin along with any other information as far as metals, etc. I’m not saying they weren’t sent home, but that was almost hundred years ago. I guess there’s absolutely nothing left for me to try at this point, but when I came cross your site I knew I owed it to my Great Uncle Arthur Lee to try and not let his death have been in vain. I recently saw discharge papers from my great grandfather, it listed that he was in the Meuse Argonne offensive. He was in L company of the 116th. His name was Albert Don Turner. I have pictures of him if there is anywhere to add them. Like many of the above I suspect my grandfather was present at this campaign. His name was Raymond James Stewart (1893-1959) from NYC, and he enlisted April 29th,1918 and was honorably discharged June 25th, 1919. He was a Private 1st class in Company B of the 304th Infantry of the 76th Division and served overseas from July 7th, 1918 – June 16th, 1919. He was hospitalized for a period at U.S. Army Base Hospital No. 81 at Bazoilles sur Meuse. Later in life he was completely bedridden with rheumatoid arthritis and spent his last years in the Brooklyn VA. Likewise I have photos and other memorabilia I would be willing to post. My Grandfather Edward Leo Myers participated in several major U.S. engagements of the war. He fought in Cantainy, Soissons, Battle of Saint-Mihiel, and the Meuse-Argonne Offensive. All of these offensives had great historical importance as they marked the Allied Counter Offensives to the German Spring Campaign of 1918. The counter offensives eventually ended the war. In addtion, Edward was in the 16th Inf. part of the 1st Division known as the “Big Red One”. On 3 November 1917, while occupying a section of trenches near Bathlémont, the 16th Infantry became the first U.S. regiment to fight and suffer casualties in the trenches during World War I when it repelled a German night raid. (Edward had not yet arrived for this engagement) In the months that followed, the 16th Infantry would sustain even more casualties in defensive battles at Ansauville, Cantigny, and Coullemelle. The regiment’s first major attack was made during the bloody three-day drive near Soissons in late July 1918. Along with the rest of the Big Red One, it relentlessly attacked until a key German rail line was severed forcing a major withdrawal of the enemy’s forces. The regiment also participated in the First U.S. Army’s huge offensive to reduce the St. Mihiel salient in September. Arguably the regiment’s most gallant action was the grueling drive that liberated the little village of Fléville in the Argonne forest region on 4 October 1918. This feat was significant in that the 16th Infantry was the only regiment in the entire First Army to seize its main objective on the first day of the Meuse-Argonne Campaign. To this day that action is celebrated annually during the 16th Infantry Regiment’s Organization Day. Interesting History: He was wounded on October 5, 1918. He was listed as being gassed in the eyes, throat and scrotum. He received his Purple Heart in 1932. My father Charles Edward Balzer (1896-1989) was 60 when I was born. He was in the 90th Division, 344th MGB in the St. Michel and Meuse Argonne Offensives. He was a first sergeant. He never answered any of my questions, but he left all of his papers for me to find after he died. My son and I are going to France next summer to visit the areas where he fought. My dad’s cousin Harry Mark Coppinger is buried at the Aisne Marne Cemetery. Thank you for the honor to remember them. All of these men who were just boys.